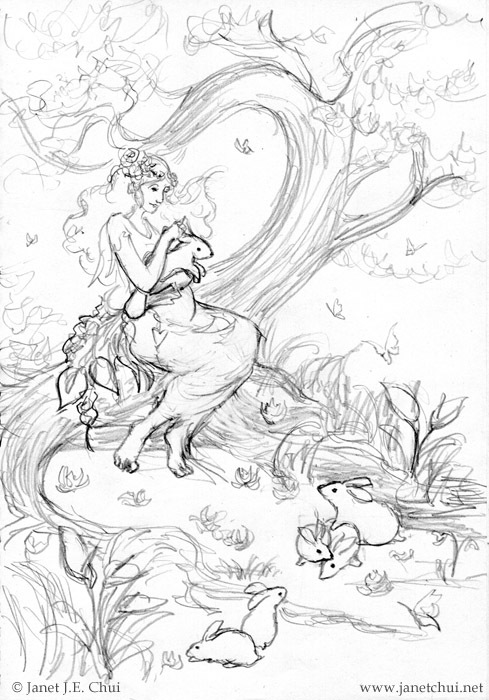 Ostara quick pencil sketch. All rights reserved. Some favourite links from the past week. On a greater level, processes like this play out in societies. If we don’t look at the darkness within our world, it can become exacerbated like the emotional issues we avoid, and systems of control can manipulate us into submission with our fears. This erupts in manners akin to the mental and physical illness we experience when this occurs internally: violence, addiction, illness, poverty, etc. “The Event” Deception–Another Dangling Carrot I love this piece. It is much easier to get the intel from pseudo-spirituals and their astral cohorts than to get the pristine uncorrupted guidance and truth from the One who created all knowledge to begin with. So the easy route, otherwise known as the path of “thinking our way to enlightenment” via disinformation brokers – who are more than happy to provide the golden nuggets of truisms, mixed in with blatant lies – is the path of choice. The lies that have been fed to us have kept us from truly taking the appropriate steps necessary to earn our spiritual mastery. I always remember the books that made me cry. And I seem to remember that they made me a bit maladjusted, actually, and maybe they still continue to do so, though I barely read fiction now–more like books about modern slavery and economic injustices that formed the bulk of my reading list from 2004 to 2009. Fiction or non-fiction, I would get come out of the reading experience impatient with people who didn’t understand the perspectives I’d gained, especially when they didn’t seem interested at all. The question “why do you care about that stuff?” or “that’s depressing” or implications that difficult topics were a waste of their time infuriated me. The more important question, to me, was always: why didn’t THEY care? And how the hell could they think they were not connected or affected by certain things? Did they care to know that their favourite chocolate came from child labour in countries without human rights? Would they be mad at being inconvenienced to buy fair trade chocolate? Didn’t they want to be part of a better world where they understand what was going on, etc etc. Ignorance has certainly seemed like bliss, but has never been my style. I suppose what bothered me more about my choice of reading in my life has been my isolation. I’ll certainly what my daughter to read widely, as long as the contents are suitable for her level of understanding.